NASA's NanoSail-D soars in Earth orbit in this artist's illustration. 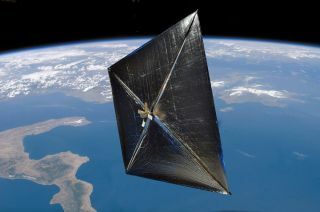 Skywatchers who have yet to spot NASA's prototype solar sail in orbit can take heart -- the little satellite will be zipping around Earth for a few more months yet, space agency officials say. NASA's NanoSail-D satellite was originally expected to burn up in Earth's atmosphere 70 to 120 days after unfurling its 100-square-foot solar sail, which happened Jan. 20. But the satellite is descending more slowly than anticipated, meaning it should stay aloft at least until July, NASA officials announced today (April 26). The mission team, Alhorn added, now "predicts NanoSail-D will continue to descend and eventually re-enter Earth's atmosphere and disintegrate six months to one year from sail deployment." NASA and the skywatching website SpaceWeather.com are holding a NanoSail-D space photography contest for the best photos of the solar sail. First prize is $500. In North America, a good viewing window will open in the early evening of April 27 and continue for 10-14 days. For the best look, skywatchers should seek out NanoSail-D passes to the west of the viewing location, officials said. The change in NanoSail-D's deorbiting plans is in keeping with the little satellite's mission, which has been full of surprises so far. At launch, NanoSail-D was one of six different scientific payloads aboard a larger satellite called FASTSAT, which is about the size of a washing machine. On Dec. 6, NASA engineers triggered the ejection of NanoSail-D from FASTSAT. But it apparently didn't work. Then, on Jan. 19, officials announced that the little satellite had spontaneously popped out of its mothership. Two days later came more good news: NanoSail-D had successfully deployed its solar sail. "The NanoSail-D mission is NASA's first compact structure to deploy in low-Earth orbit and will be the first solar sail to deorbit," said Joe Casas, FASTSAT project scientist at Marshall. "The NanoSail-D mission continues to provide a wealth of data that will be useful in understanding how these type of deorbit devices react to the upper atmosphere." The NanoSail-D team has been monitoring the craft's orbital characteristics since sail deployment. They've found that the satellite is orbiting Earth in a flat spin rather than the expected random tumble. That's good news for skywatchers, who now have a longer window to spot the prototype satellite. As the little spacecraft continues to descend, sunlight glinting off its reflective, tent-size sail will become more and more visible. The website Heavens-Above (http://heavens-above.com/) provides sighting predictions of NanoSail-D for any place on Earth over the next 10 days. Another site is Real Time Satellite Tracking (http://www.n2yo.com/?s=25544), which tracks NanoSail-D and a variety of other satellites on an ever-changing world map. It offers 5-day sighting predictions. Finally, you can use an app (courtesy of SpaceWeather.com) to get the latest satellite predictions on your iPhone.